Veneers are a revolutionary way to improve the appearance of your teeth. Each veneer is custom-made to attach directly onto the front of a tooth through a bonding process, covering up any and all cosmetic defects. They are approximately half the width of a dime and are expertly shaped and painted to be realistic and flawless. Some people have just one small cosmetic dental flaw, such as discoloration from coffee drinking or a minor chip, that can be fixed with a whitening treatment or an application of bonding. However, a lot of patients your Mill Creek dentist sees are dealing with a combination of misshapen teeth, whitening-resistant stains, gaps, overlaps, or breakage. Rather than having all these problems fixed individually, veneers correct them all with one restoration. 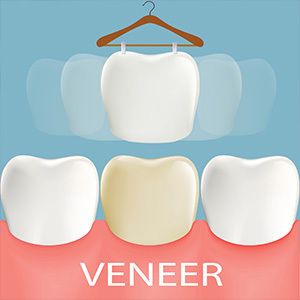 Quality veneers from your Mill Creek dentist can be made from one of two materials: porcelain or composite resin. Porcelain is a ceramic that is noted for its strength and realistic appearance to natural tooth enamel. Porcelain veneers typically last between one and two decades before replacement is needed. Composite resin is typically less expensive than porcelain and yields realistic results as well, but its plastic-and-glass structure is not as durable. Composite veneers are therefore more apt to stain and chip and will need maintenance within approximately five years. If you'd like to learn more about veneers from your Mill Creek, WA, dentists, Dr. Chad Slocum and Dr. Sara Lundgaard, contact Penny Creek Family and Implant Dentistry to set up a consultation today!